For more than 15 years, Freedom CAD Services’ mission has been providing our customers with the best service and highest quality while striving to deliver on time and on budget! 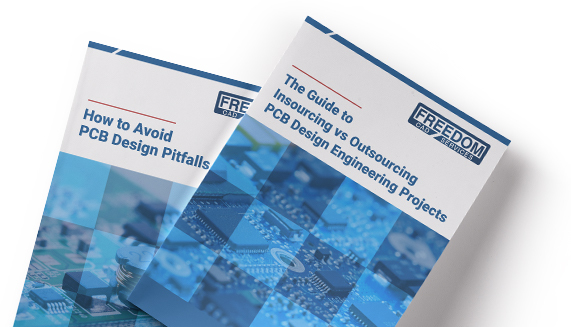 Our services include Printed Circuit Board (PCB) design, electrical, mechanical and signal & power integrity engineering to PCB layout and quick-turn, prototype hardware program management. Backed by ISO 9001:2015 certification and ITAR registration (documentation for both is available upon request), our team is fully equipped to serve your specific industry in virtually any application. We design rigid, flex, rigid-flex, and HDI PCB’s for voice, data, video equipment, broadband and mobile communications, fiber-optics, radios, satellites, routers, access networks, carrier networks, and base stations. We design PCB’s and enclosures for signal board computers, servers, mainframe, supercomputers, back panels, and Cloud peripherals. For electronic storage manufacturers, our highly-committed staff design printed circuit boards and other components for memory systems, DDR2, DDR3, DDR4, network, Cloud, optical, and peripherals, and RAID equipment. Reference designs, evaluation boards, verification boards, emulation boards, and test boards are just some of the products and services we provide to our clients in the semiconductor industry. For the healthcare and medical equipment industries, we provide design engineering services for medical, dental, and laboratory equipment, surgical devices, and image scanning systems, among other equipment. We count some of the world’s leading medical equipment manufacturers among our valued customers. We provide a wide range of PCB design services for automotive control systems, diagnostics and sensor systems, infotainment, autonomous driving, and stabilization systems. Our services meet the automotive industry’s stringent quality assurance and safety standards. In terms of broadcasting equipment, we provide printed circuit board design services for HD Video equipment, transmitters, routers, and set top boxes. For the military and aerospace industries, we provide PCB design and related services for avionic electronics, control systems, satellite, undersea equipment systems, communications, weapons, wearables, and in-flight entertainment systems. We provide printed circuit board design services for home entertainment systems, internet-enabled devices, storage devices, sensors and controls, wearables, home electronics, AR/VR headsets, lighting, lawn & garden equipment, and fitness equipment, among other consumer electronic items. We design industrial controllers, device under test (DUT) boards, in-circuit test boards that are used in ATE equipment, and radio-frequency (RF) Systems. The above list contains just some of the common applications we work with. With our decades of experience and more than 50 designers on our team, we are fully prepared to bring the highest quality service to your industry and business, regardless of your size. Reach out today to learn more about what Freedom CAD can do for you.